Enjoy a picnic surrounded by the beauty of the countryside. With 3D sounds! What can be more relaxing than a picnic in the country? Pop this CD on your computer or music player, and you can enjoy this delightful experience even in the depths of winter! Close your eyes and you’ll picture yourself in a clearing in the forest. It’s a warm, sunny day, and trees sway gently in the very lightest of summer breezes. The birds are singing, and everyone is happy and relaxed. You breathe in the good fresh country air, and feel it permeating your body, relaxing and recharging your whole being. Someone opens the picnic basket and you help yourself to good food and drink – whatever you most enjoy, you’ll find it there! 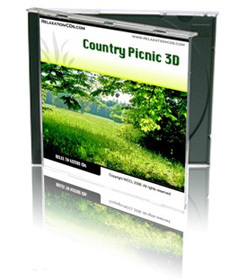 And when at last your picnic is over, you’ll return home relaxed, refreshed and re-invigorated – knowing that any time you need it, your perfect country picnic is there, on this CD, for you to revisit! By default, this CD includes background music. If you would like to order this CD without background music, please click here. To preview without music, please click here.